SAFPA’s annual cycling team competition was held on Friday, 24 October, 2014. The total race distance was ±40 km, made up of 4 laps of ±10 km per lap. Seen here are the members of Honingcraft’s winning team. 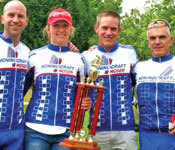 From l, Honingcraft’s winning team: Justin Dowdle, Alexa Terblanche, Allistair Bassett, Andre Marais.